Trilogies bring to mind epic movies for us. Movies that start great enough to deserve two more follow on movies. Action adventure classics like Mission Impossible, the Matrix, Indiana Jones, Terminator, Spider-Man, Die Hard, the Bourne Trilogy and the Godfather (which we are watching now because somehow Ro has gone her whole life without watching one of them). The funny ones like Austin Powers, Naked Gun, Pirates of the Caribbean, Toy Story and Back to the Future. Not to be forgotten, the scary entries like the Hannibal Lector series, Scream and Alien. 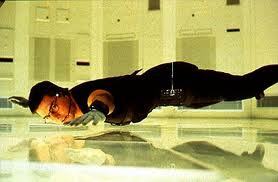 Then there are the special cases where the original movie spawns a dual trilogy. Take the Star Wars trilogy for example, which spawned the prequel trilogy. Likewise, the ever popular Lord of the Rings trilogy has recently released the Hobbit which will have to wait and see how many additional movies come hereafter. We enjoy movie trilogies, but if we find a good restaurant, there's nothing better than when the owner strikes out with new restaurants. One of our favorite Seattle restaurant trilogies is by co-owner/chef Renee Erickson where she just completed opening up her newest restaurant the Whale Wins. However, just like with most movies we think the original is still the best (we admit we are biased critics because we've been huge Boat Street Café fans for years). We recently visited each of the restaurants to taste and experience each of these restaurants with their distinct character differences, but also to appreciate the similar plots they all share with a common thread being woven throughout each tying them together. These restaurants are indeed the brainchildren of Renee, never one to stay still. She studied art at the University of Washington and worked at Boat Street (under different ownership at the time) while she went to school. She spent some time in Europe learning about her two loves, food and art. 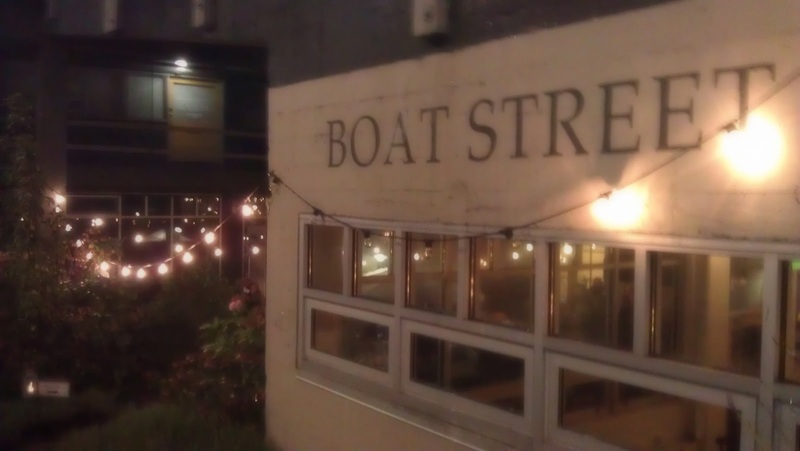 Upon her return, she decided to purchase Boat Street Café and make it her own. 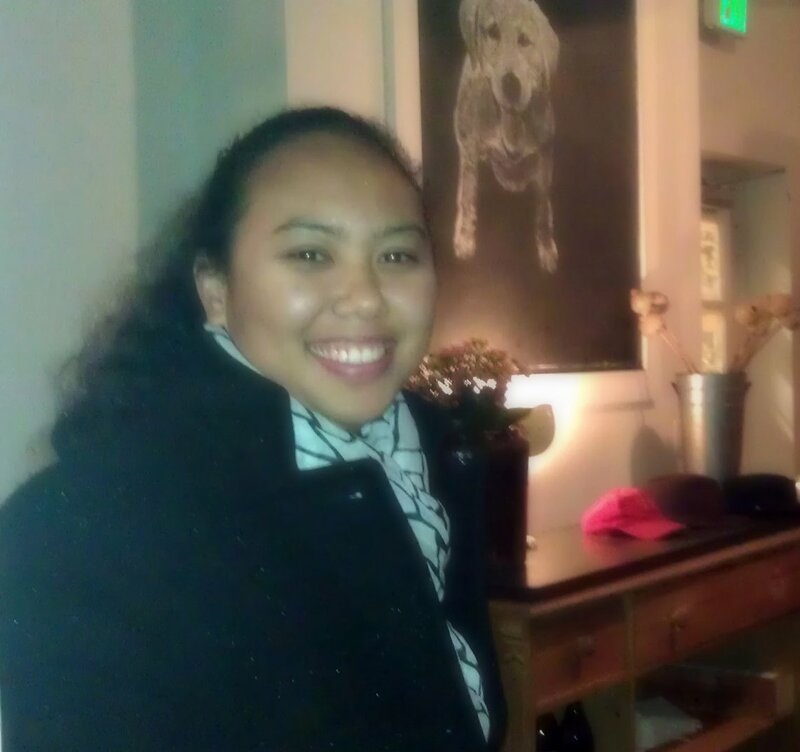 Renee has traveled extensively in France and the decor of Boat Street reflects that of a small intimate Parisian café. 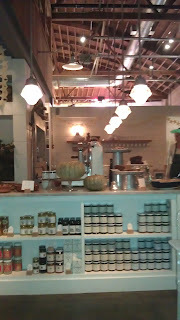 The white-washed rafters, eclectic chairs and marble bar at the front of the restaurant eek with French country charm. 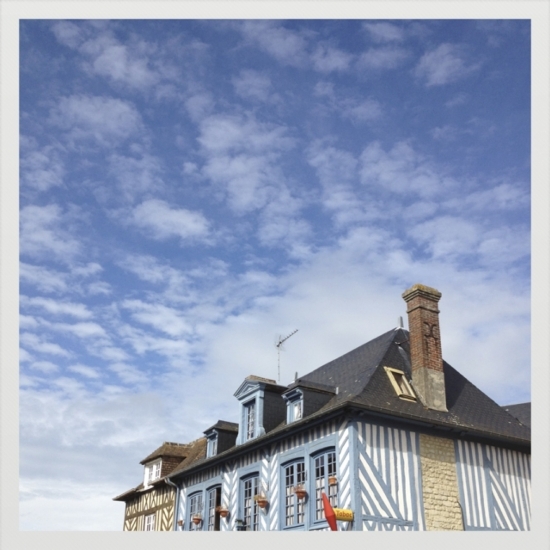 Ro and FloJo have spent several lunch-hours escaping to France via this little café as it was just down the street from Ro's former accounting firm. 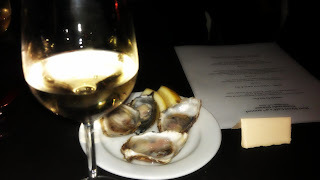 It also has one our favorite Seattle summer happy hours where you can get a nice summer bottle of wine and delightful French appetizers all while eating out on the patio. Suddenly we escape the city of Seattle and are transported to a city café in Paris. 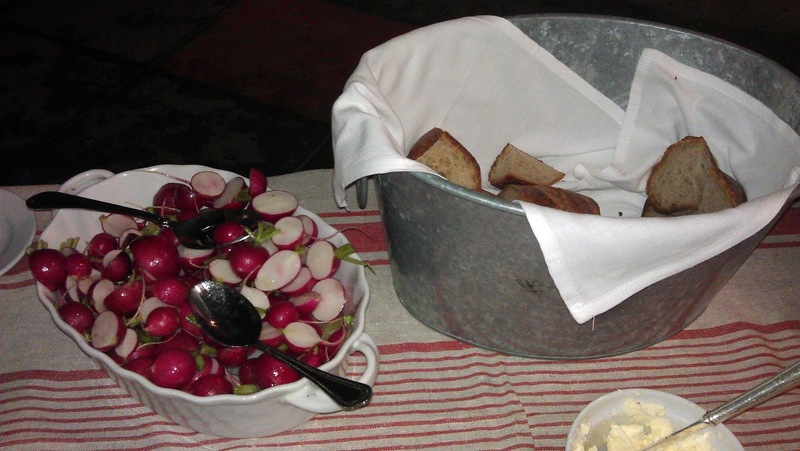 The food is an interesting mix of French Provençal and local organic Northwestern. One of FloJo's favorite items on the menu is the Carlton Farms pork chop. 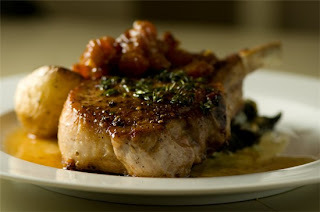 The connection to this chop illustrates Renee's commitment to local purveyors and using the finest of their ingredients. This pork chop comes from Russell Flint's Rain Shadow Meats. 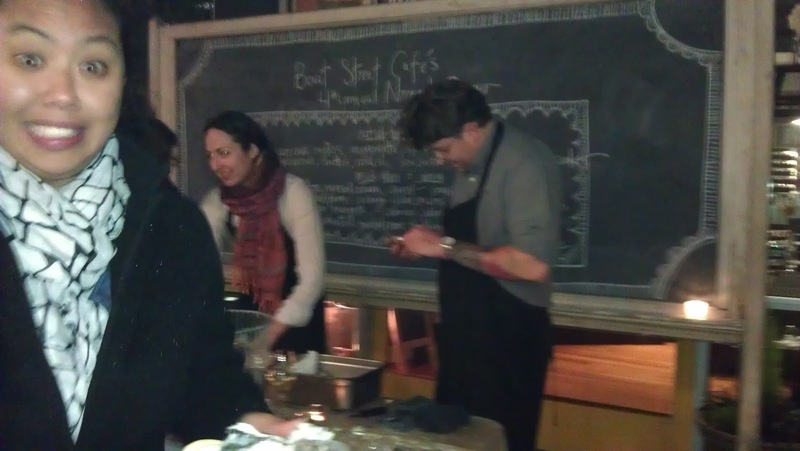 Russell met Renee back when he was first learning butchery at Whole Foods Market. The two became friends and he followed her to her new restaurant and became Boat Street's Sous Chef. Renee had a big influence on Russell and encouraged him to take a chance when space became available in the Melrose Market to open his own butcher shop. Not only does it provide Fred Flintstone size chops for Boat Street's menu, but some of the best meat in town including house-made sausage. 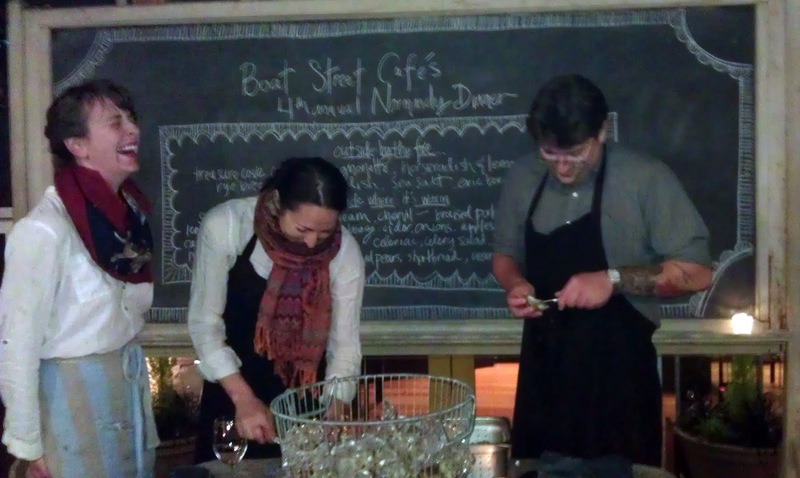 Most recently we visited Boat Street Café on their 4th annual Normandy night. 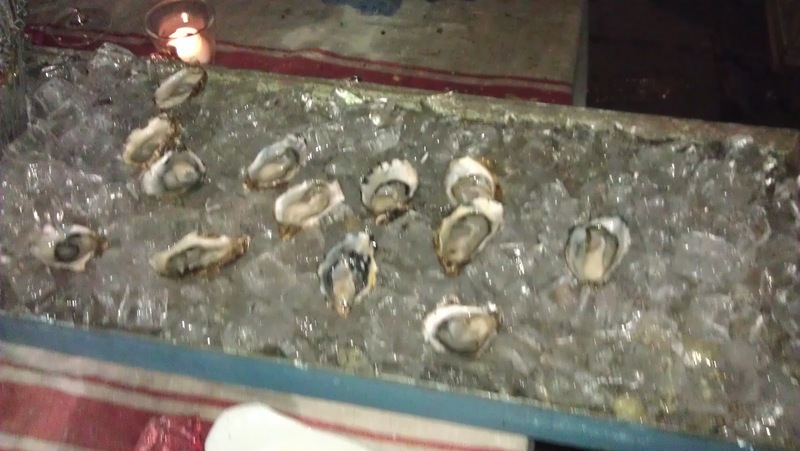 This was our first time attending this event and we were immediately excited to see the spread of oysters on the half shell, shucked and ready to be devoured by guests. 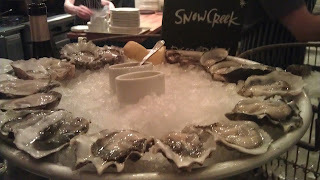 Renee later told the group that they were Treasure Cove oysters with champagne mignonette from one of the local shellfish farmers she's discovered and made a connection with. They were plump, succulent and tasted like the ocean from which they came. It was a cold November night and guests were enjoying the oysters and conversation as they huddled around the fire pit trying to stay warm. 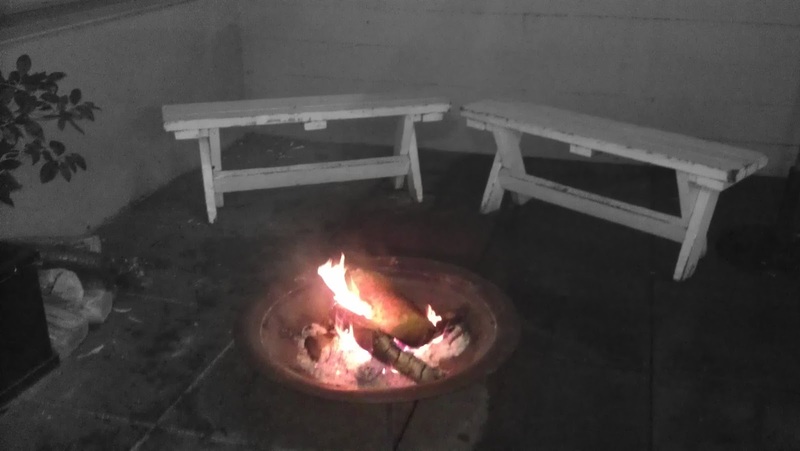 We were reluctant to go inside despite the cold, not wanting to part with the delicious oyster bar. We compromised, and took a plate of the shellfish with us to our table so as to not miss the next course of this Normandy dinner. The café is intimate and there was assigned family style seating. We got seated by some people (later to find out their names were Allen and Claudette) and we quickly started chatting with them and they joked that they were not going to let us out again the rest of the evening so we were not going to be able to drink very much. Renee stood up and introduced the menu and how it was inspired by a recent trip she took to France. 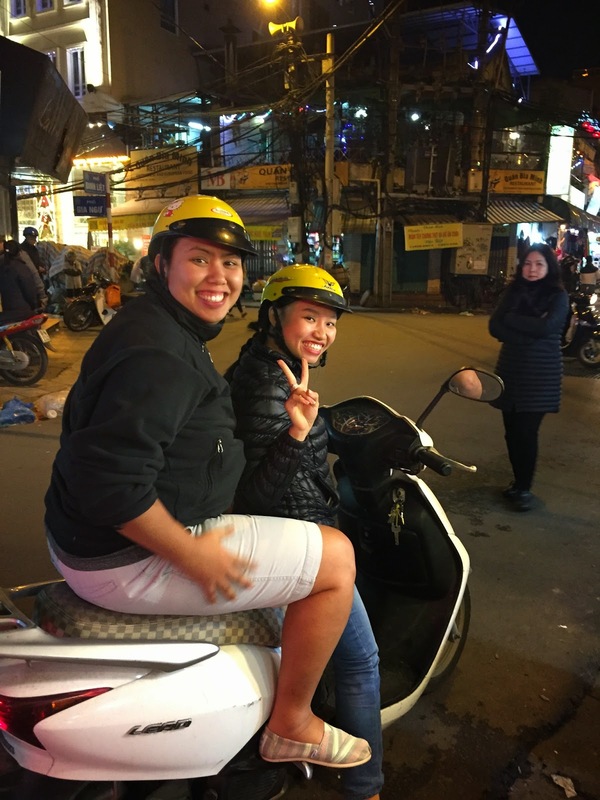 She described how that annual trip serves as her inspiration and she comes back and finds products locally that allow her to translate what she experiences in Europe into something wonderful sourced right here in the Northwest. She also learns about and tries different French wines and pairs those wonderfully with the dishes. 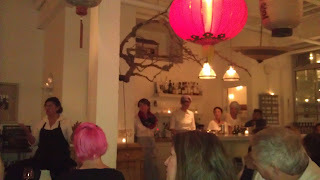 She also talked about her newest restaurant baby, the Whale Wins and how she had been getting it set-up for opening. 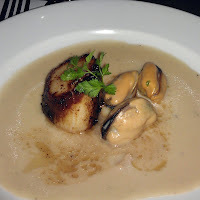 The inside courses started out with the richest and most succulent mussel and scallop combination. The scallops were seared perfectly on the outside. 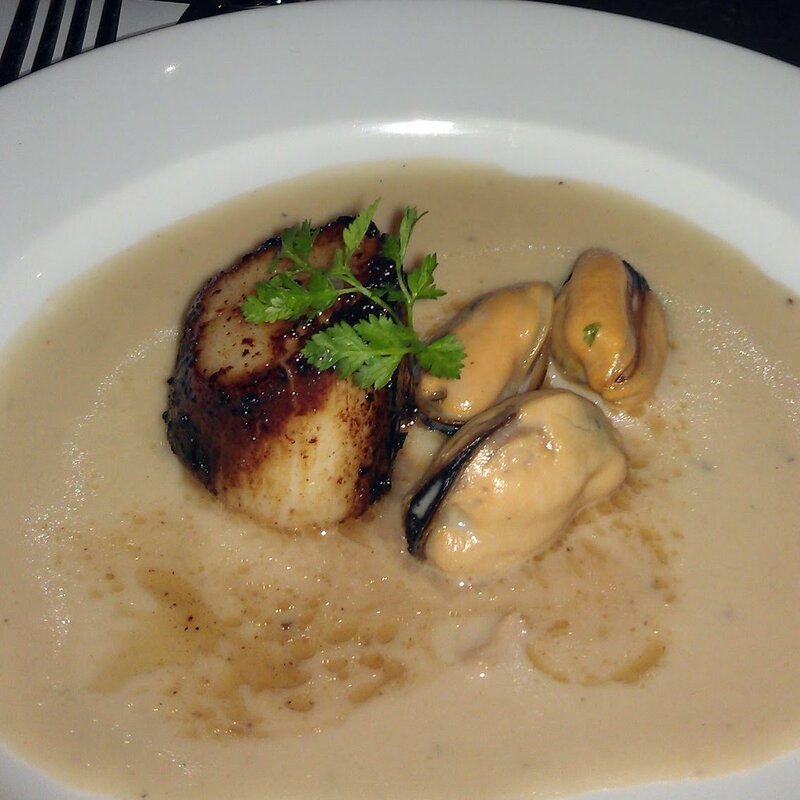 The seafood paired perfectly with a rich, creamy sauce that had a hint of dijon and cider. Perfectly paired with a light 2010 Beaujolais where most would try to match this course with a white wine. We loved the pairing. The entree was tender braised pork shoulder served along side roasted root veggies (parsnips and carrots) in brown butter with Willowood Farms (Coupeville, WA) cabbage braised with cider, onions and Tonnemaker Farms apples. 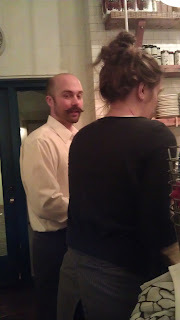 The best server in the city, Shannon, was working that night and it was fun to see her. She's so attentive, knows the menu and wine list like the back of her hand and always has her hair tucked up in a super cool scarf wrap. 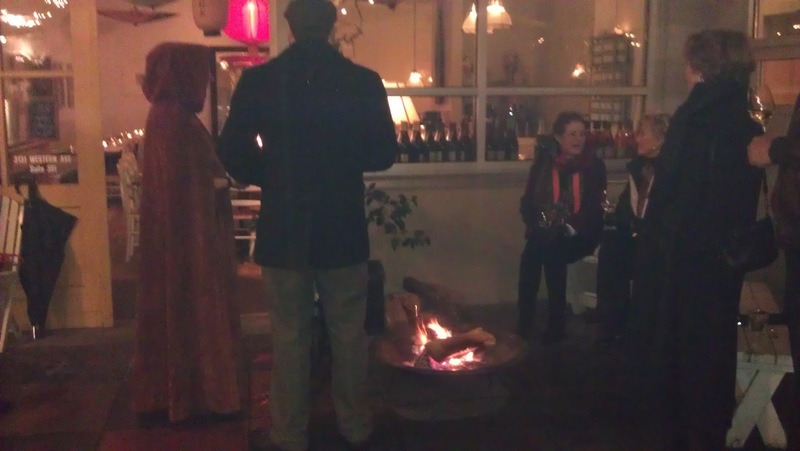 She kept the 2009 Domaine Gauby Cotes de Roussillon Villages Les Calcinaires Rouge flowing. This wine is from a vineyard in France focused on biodynamic viticulture. The wine was well balanced with elegant fruit showing through. Next we had a really bright celeriac salad with poached rabbit. The dressing was a walnut oil vinaigrette paired with a 2010 German Scheurebe Half Trocken. Dessert was supposed to be poached pears with shortbread, but there was a bit of a mishap and the pears were overcooked. We appreciated Renee's honesty and that she didn't try to serve something that was not up to par. Instead, we ended the meal with shortbread cookies and Dinah's cheese from Kurtwood Farms, Vashon Island. It was a buttery creamy cheese with a similar style to Camembert. A very delightful meal from start to finish. We ended by getting a photo with Renee and our new friends we sat by that night, Claudette and Allen. Our next adventure took us to Fremont and Renee's newest restaurant the Whale Wins in converted warehouse space. The restaurant shares the space with another restaurant Joule (right across the hall, which recently relocated from Wallingford). 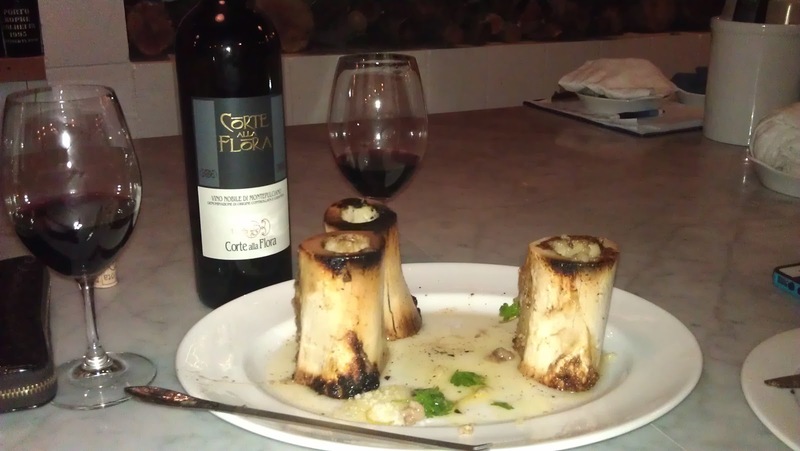 The Whale centers around a huge wood-fired oven where most of the dishes emerge from. 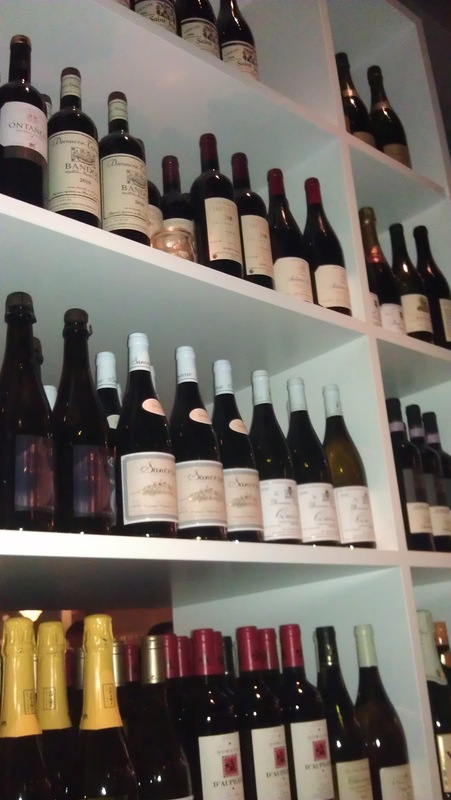 Like Boat Street, there are plenty of bottles of French wine on display and the cuisine is inspired by Renee's travel experience in Southern France and England. 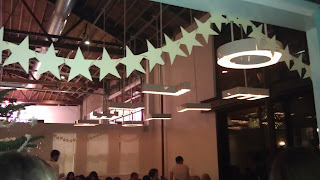 The space has very high ceilings and for a whimsical touch there are light fixtures above one of the dining spaces spelling "HELLO" in both directions. It was inspired by Renee's good friend who is an artist, Jeffry Mitchell, who's signature greeting is "hello, hello." We also saw little whales, whether framed or scupltered, scattered amongst the decor of the restaurant. The restaurant doesn't take reservations so get there early or expect to wait. We waited for about 20 minutes and were ready to eat as soon as we got seated at the bar. We started with a couple of glasses of champagne to celebrate the recent approval of marriage equality here in Washington. 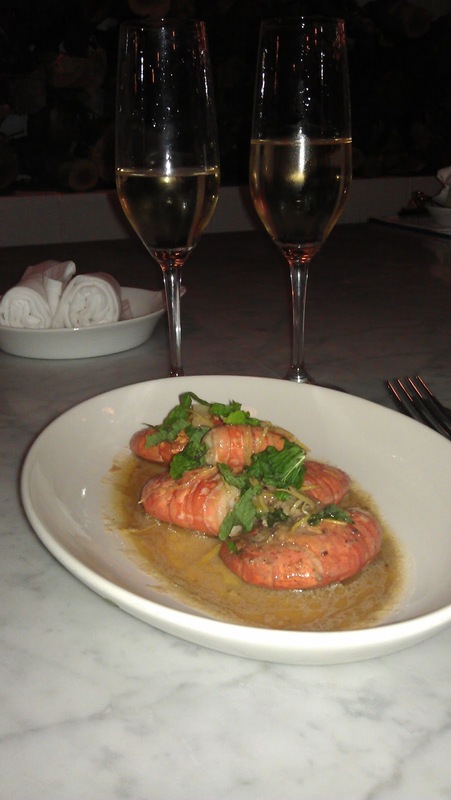 We chose Alaskan spot prawns as our appetizer as these are pretty rare to find on menus. These prawns came out of the oven covered in anchovy, garlic and butter. Our cute waiter had warned us that these would be messy because you had to take them out of their shells. 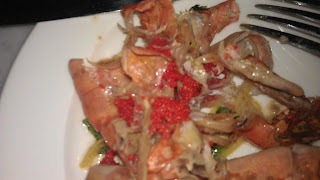 What we weren't warned about was the bright red roe attached to the underbelly of the prawns. We asked our waiter about it and he explained that the roe appears only certain times of the year and can be purchased this way. He told us also that conversely rock prawns have blue roe, which was an interesting piece of trivia. It gave Ro chicken skin just by looking at it. Let's just say Ro was not enamored with this roe. We were trepidatious to put the roe in our mouths, but finally got the courage up, rationalizing that caviar can be a prized commodity. The texture was a bit off-putting as if you were eating tiny bubbles that shot salty-briny liquid into your mouth. The taste was not terrible, but we decided this was a little too much mother nature on a plate. Sitting at the bar we had a great view of a shelf filled with barware. 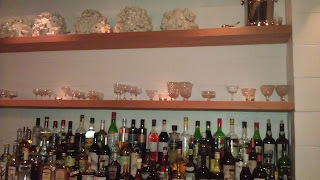 We loved the eclectic barware as we'd been on the hunt for some antique champagne coupes. We were impressed to find out that this collection was all antiques that Renee sourced and bought. They have to all be hand-washed, which I'm sure doesn't make the staff too thrilled. Hopefully these don't get broken because they are stunning pieces and such an elegant touch. 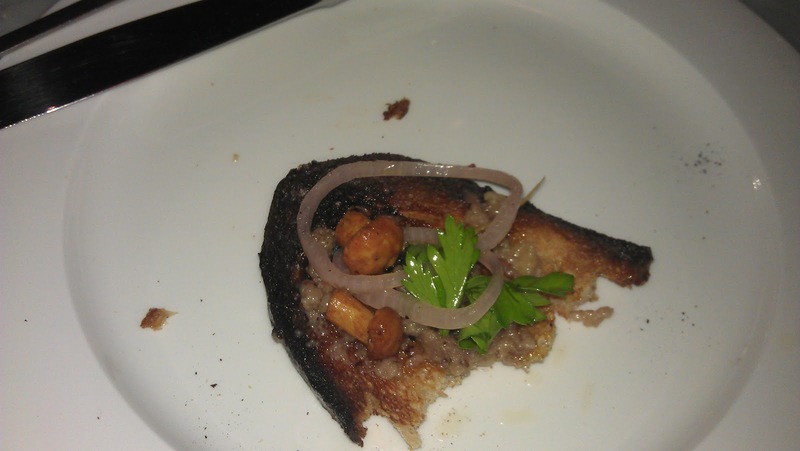 We moved on to another fun to eat dish, marrow bones with a pickled chanterelle salad and toasts. The serving knife to get the marrow out was pretty unique, like a long metal stick. The marrow took a bit of work to get out. We found that it didn't have much of a taste though for all that work. We were definitely working for our supper this night. 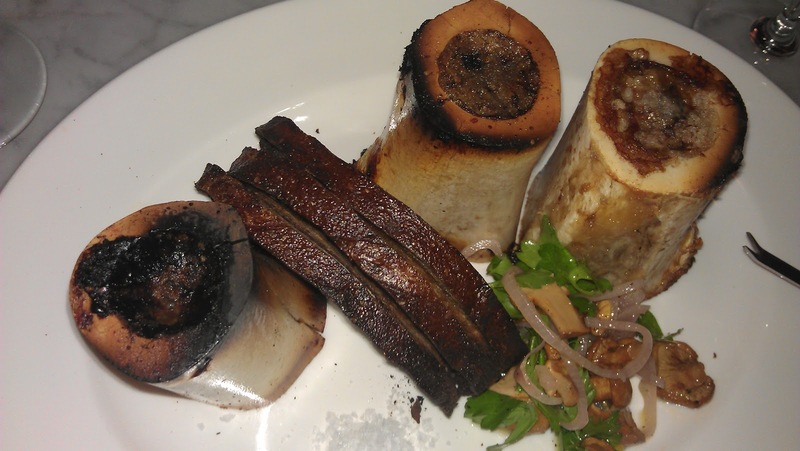 When we finally did get a piece of the marrow, it was greasy and fatty, which is probably how it's supposed to taste, but not our favorite. To pair with the rest of our meal we picked about the only non-French wine on the menu, a 2009 Corte alla Flora from Montepulciano (one of our favorite wine regions in Italy). We had just visited Umbria, but missed going to Montepulciano, but have enjoyed trying different bottles from this wine region when we see them on a menu. We moved ahead to a whole braised Yakima river trout roasted with lemons and walnut sauce. 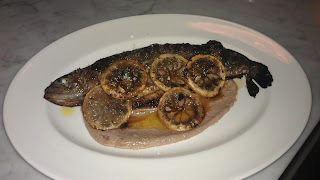 We both think it's probably the best trout we've ever had. It was perfectly moist and flavorful, which we are guessing came from some type of brining. Ro ate the skin, which was crispy, but just a little too salty (possibly from the brine). The walnut sauce was tasty and had a texture that reminded us of hummus. We think it had garlic, lemon and olive oil in addition to the pureed walnuts. Next up, we finished the meal on a high note. Ro's favorite dish of the evening was the Carlton Farms pork shoulder with Winesap apples, onions and mustard. 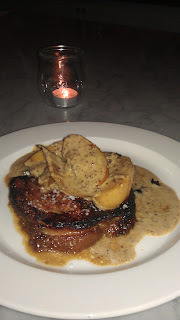 The mustard was a predominant flavor in the dish, but married nicely with the pork and apples. The meat was perfectly cooked and complimented by the wonderful sauce. A perfect winter dish to warm the soul. Speaking of warming the soul, newly launched is the Whale Call Happy Hour. Whale Call begins at 3 PM (calling all you early to leave worker bees) and goes until 5 PM Wednesday through Sunday. It features $5 and $6 pours of Cotes de Gascogne and Rioja wines respectively. Also, $1 off appetizer snacks such as cheese, house-made pickles, charcuterie, tartines and draft beers. That sounds like everyone wins, not just the whale. 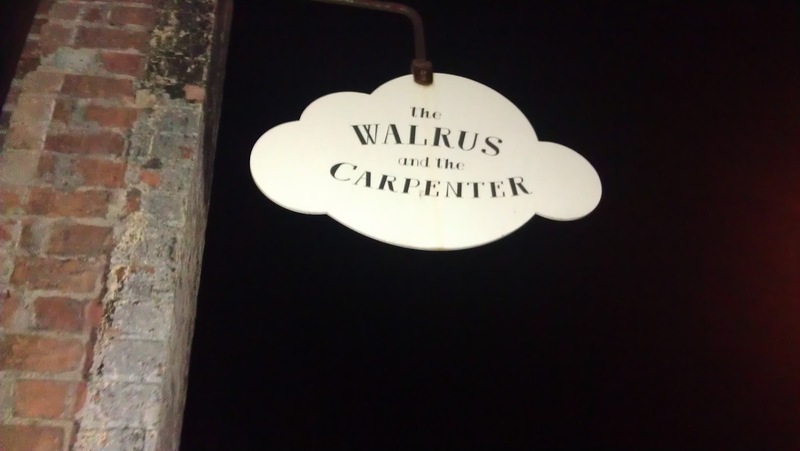 Our last stop on this trilogy tour took us to the restored Kolstrand building in Ballard to check out the Walrus and the Carpenter. 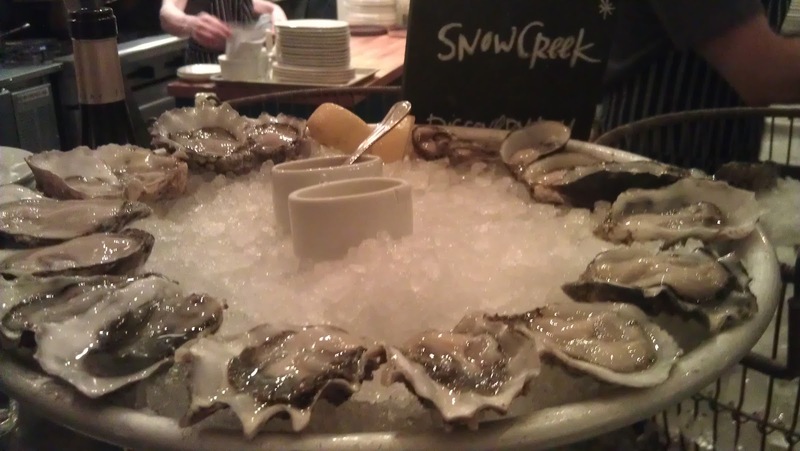 This is an oyster bar with the quirky feel of being a Ballard pub. Renee lives in Ballard so this restaurant is right in her own backyard. The French plot and touches are woven into this restaurant as well, along with the commitment to use the best locally sourced products. It has pub like tables along one wall with the other seating at the oyster bar itself. There are illustrations hanging around the restaurant by aforementioned, Jeffry Mitchell. 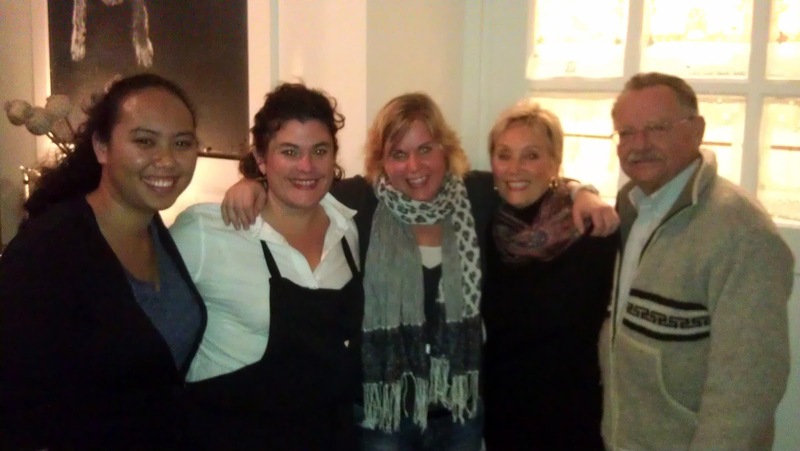 In true Renee fashion, she honors relationships in her life by giving them opportunities and parts in her restaurants. 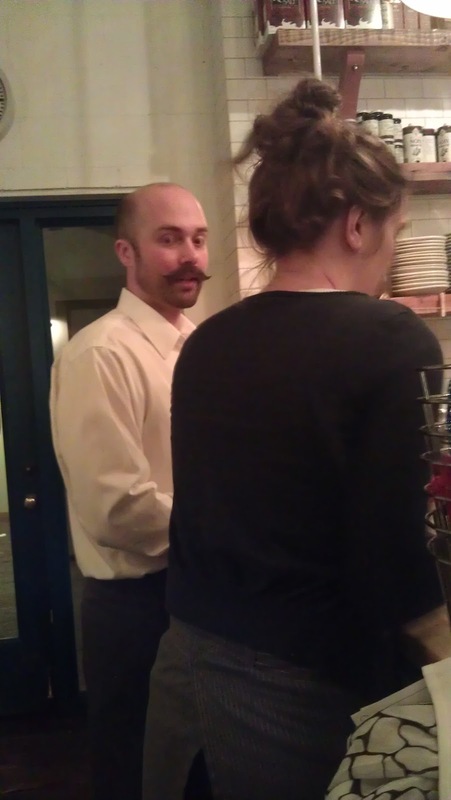 Jeffry is a gifted artist, but is also a server at Boat Street Café. Jeffry has recently had his art at the Henry Art Gallery, Seattle Art Museum, Philadelphia Art Museum, Portland Art Museum and Fogg Art Museum (Harvard University). 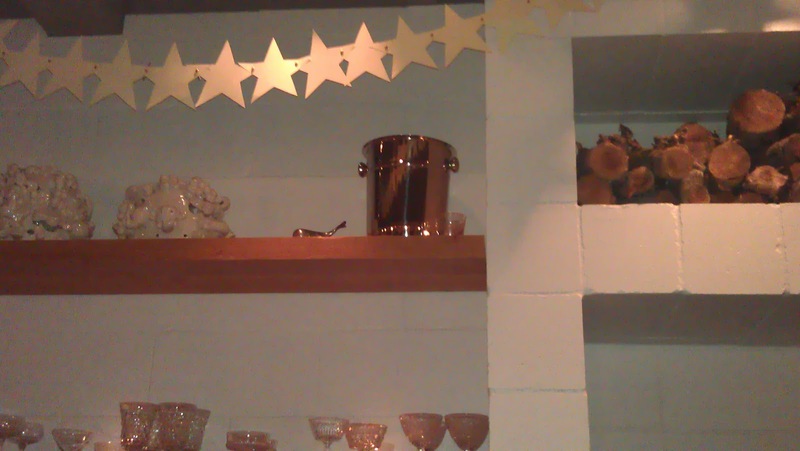 Not only is Walrus decorated with cool art, it's often visited by foodie VIPs. 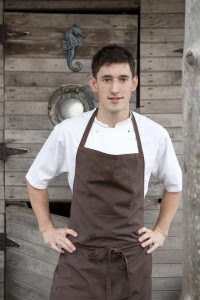 Andrew Knowlton of Bon Appétite magazine honored the Walrus with his #3 spot of Best New Restaurants in America for 2011. 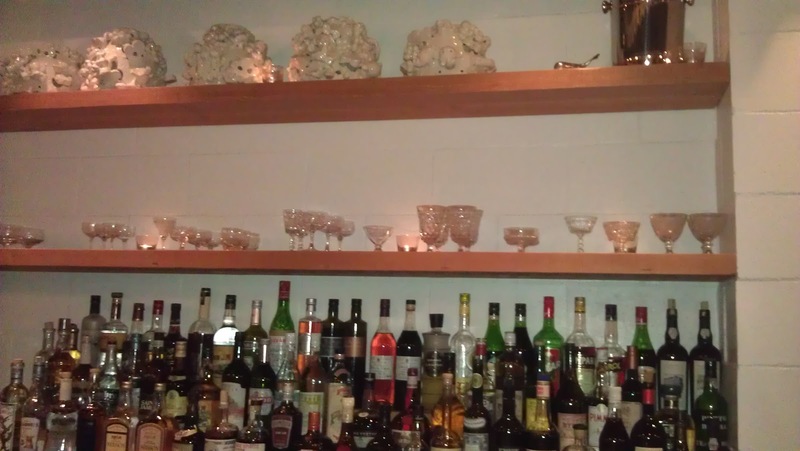 Upon his visit to the Walrus and the Carpenter, Andrew focused his eating around the oysters and we adopted the same strategy starting with the showcased ingredient, it is an oyster bar by the way. We very easily could have filled up just on these beauties. However, we did want to taste some of the small plates on the menu as well. 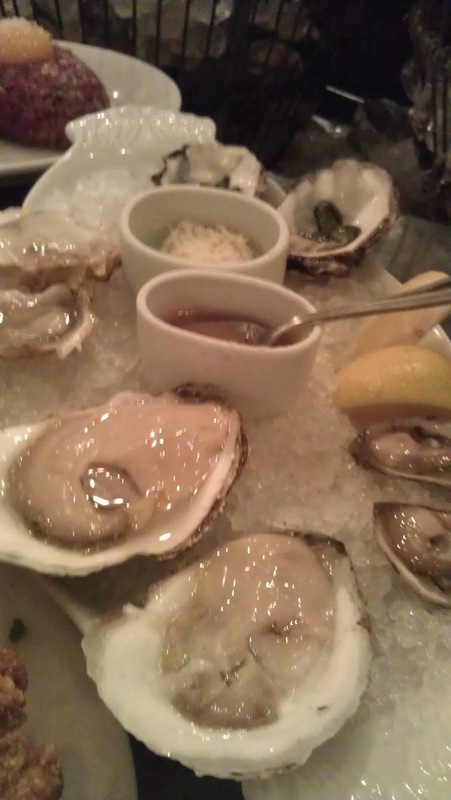 We began the adventure with a tasting plate of each of the nine oysters on the menu. We began to taste from the least briny to the most (placed clock-wise that way on the platter). We decided to do a 1-5 scoring scale so that by the end of trying all nine we knew our favorites. The only issue with our system was the first one we tried, the Olympia from Hammersly Inlet, WA was amazing. We couldn't give it 5 to start because that would leave us no wiggle room if by chance the following oysters were even better. But, it got a strong 4. In regards to the wine pairing for the evening, we were about to go with a sure bet Sancerre. 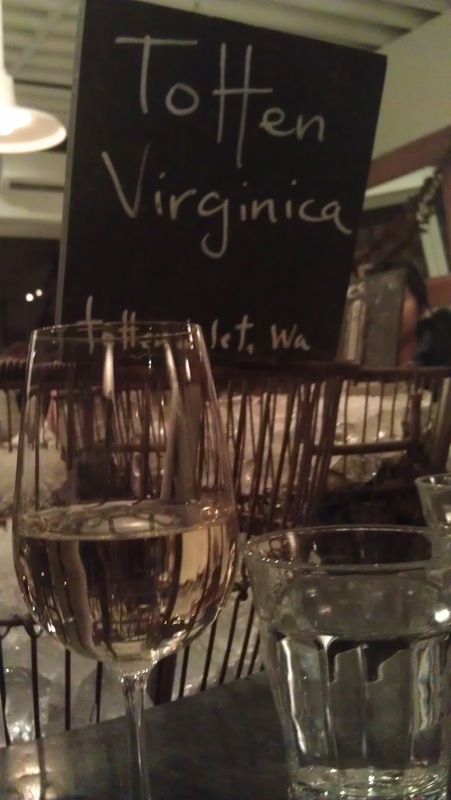 However, Sarah recommended a lovely Loire Valley white that paired very well with the shellfish. It was Francois- Chidaine, Montlouis Sur Loire, Les Choisilles, 2009 France. She said everything this wine maker produces is amazing. The vines are grown bio-dynamically on the southern side of the Loire Valley, The wine was sweeter than we expected with a very nice floral nose and smooth finish. It did accent the oysters perfectly. For our small plates, we had a hard time deciding. The people sitting next to us had the fried brussel sprouts which smelled amazing. We decided to try the fried oysters with cilantro aioli to stick with the oyster theme. Our guts told us this seemed so wrong as the raw versions were so spectacular. We ended up liking the batter the oysters were fried in, but definitely preferred our oysters raw. 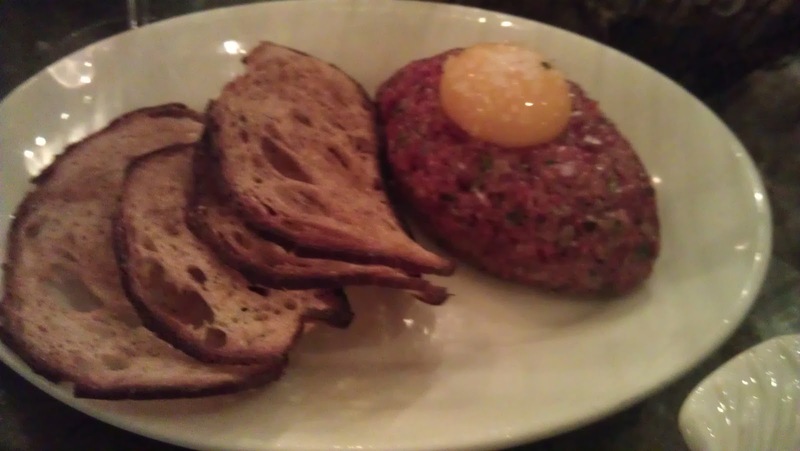 Next we got bold and took on the steak tartare with a whole raw egg yolk on top. It's kind of a mind over mouth feat to look at what appears to be a pile of raw hamburger and put that in your mouth. 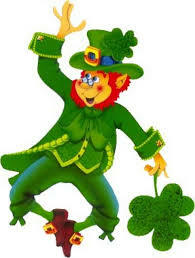 But, we broke the egg, stirred up the meat and put some on the rye toast and took a brave bite. The meat was so tender and fresh and was delicious. If you are an adventurous eater this is a fun dish to try. 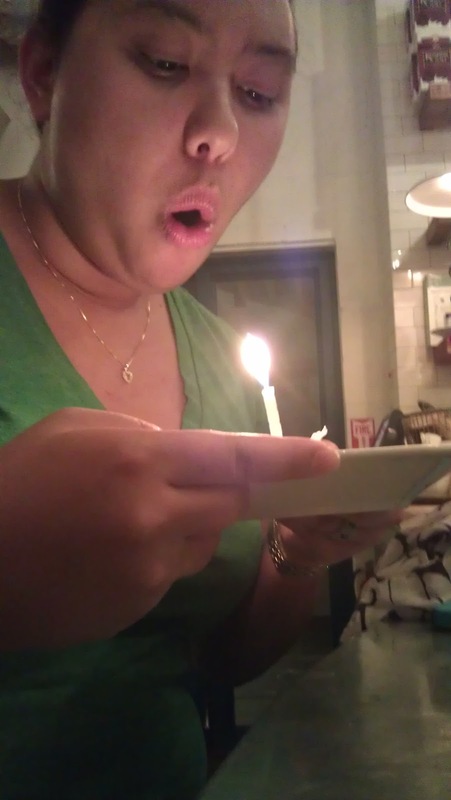 We were too full for dessert, but Ro got a birthday 'oyster' with a candle in it (we celebrated her birthday at the Walrus and the Carpenter). 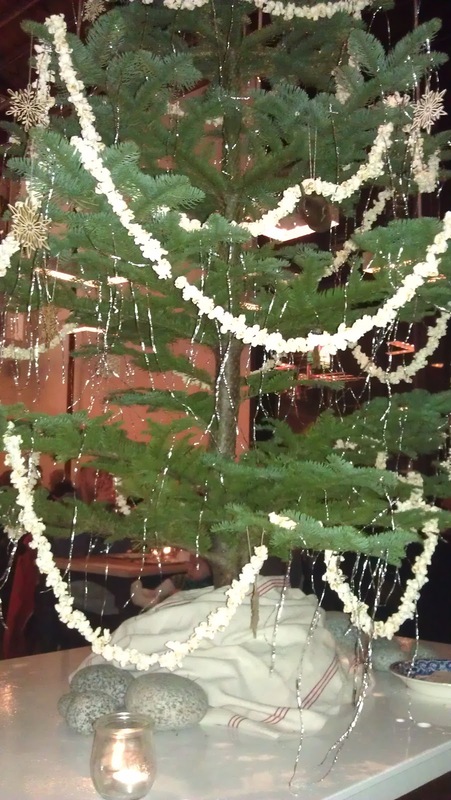 We had an amazing time here and enjoyed all the food we tried. Our only complaint is they don't take reservations. We were told the wait would be an hour and a half and ended up waiting for over an hour to get a seat. We can only imagine how hard it is to get in during the busy tourist season. Go early and during the off-season is our best advice. To recap we loved each of the different Renee Erickson offerings. Our favorite is the original, Boat Street Café, as is often the case with movie trilogies (it's hard to beat the first). Renee is not one to stop there. What's next for this budding restauranteur? Food and Wine reports she's going to join the food truck revolution. Coming soon to a Seattle neighborhood near you Narwhal. 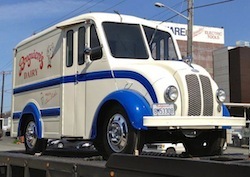 The concept is a 1960s milk truck that will be featuring oysters, oyster po'boys and fish salads. Perhaps, the first of a new breed of restaurants and the beginning of another trilogy. Whatever this inspired chef and skilled business woman decides to do, we are fans and will most definitely be eating there!